Important notice - This kit is too big for airmail using our regular mail service, but we may be able to send it (especially to EU countries) by an alternative carrier, please ask for details if interested. The B-24 Liberator was built in greater numbers than any other large bomber of WW2. It was a much more advanced design than the famous B-17 and was produced in many versions to improve the aircraft further. The Liberator was also supplied to the RAF and due to it's long range, it proved a valuable maritime patrol and anti submarine aircraft. 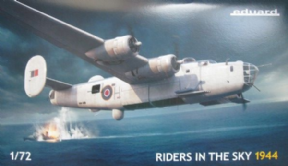 so many were converted for this role and flown by Coastal Command. In this role they could carry rockets and depth charges for attacking submarines and they played an important role in the Battle of the Atlantic. Eduard are a Czech company well known for model accessories but they also make quality kits. This kit has plastic parts from Hasegawa, who make the best Liberator kits in 1/72. Eduard have made two new plastic sprues to allow the different defensive armament configurations used by Coastal Command Liberators as well as rockets and radars. Also included are Eduard's usual mask and etch sets, Cartograf printed decals for 13 different Liberators, an A2 size print of the box art and a book (in Czech but English text available online).